Vicky Stevens is the Deputy Chief Operating Officer and Service Line Director (Older People) at the Kent and Medway NHS and Social Care Partnership Trust (KMPT). As a senior manager at KMPT she is accountable for all older adult services within the service line, employing around 800 staff with an annual budget of around £25 million. “My role as service line director promotes the importance of mental health for older adults across the health economy and involves acting as strategic lead on the development of services. I work with a range of stakeholders including third sector organisations and commissioning groups such as CCGs to understand the needs of older people with mental ill health. 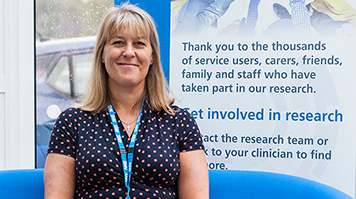 “As Deputy Chief Operating Officer I take responsibility for transformation of all the trust’s services and work with colleagues to ensure patient safety and quality of service are at the centre of everything we do. I decided to do my MSc at LSBU for a number of reasons. Firstly, although I’d held a management position within the trust for a number of years and had considerable experience, I realised that the right MSc would broaden my knowledge and help progress my career. I also wanted to study outside of the local area to be able network and share knowledge with professionals from different settings. I spent a lot of time looking at masters courses and LSBU fitted with my skill set and career path. It was a big decision and commitment to make but since graduating in 2014 I have never looked back! Two lecturers stood out for me at LSBU. Jan Warmsley and her knowledge around strategic leadership was both inspiring and powerful. Jen helped me to transfer my knowledge successfully from the MSc into the workplace. Our course leader, Judith Enterkin was also very inspiring and her belief that everyone on the course could and would progress their careers was motivational. I have two main career highlights to date. The first is qualifying as a nurse at the London Hospital in Whitechapel, which gave me the passion to work in the NHS and provide the best possible care. Secondly, leading the older people service line through our 2017 CQC inspection to achieve a ‘good’ rating across all older adult community and inpatient services was unbelievably rewarding and something I am very proud of. 2017 has been a golden year for the trust as we earned a ‘good’ overall rating from the CQC. We often face challenges; everyone wants to do the best that they can for patients within the demands placed on services during these financially challenging times. It can be difficult to recruit staff as there are many other trusts competing for new talent. My deep-rooted passion for the NHS keeps me motivated to do all I can to ensure people who need to access our services have a positive experience that supports their health and wellbeing. My desire to provide high quality safe services to all our patients is a daily motivator! I feel there’s never been a more exciting time to join the mental health sector. More and more people are talking about mental health and there are so many different career paths from occupational therapist and general nurse to patient safety lead and physical health nurse. On that note, I believe that KMPT is a great place to start or develop your career (we have a number of vacancies available at present). Kent is a fantastic county with easy access to London and lots of things to do and see outside of work. We’ve got a large number of sites from Dartford and Margate to Tunbridge Wells with a great mix of staff and volunteers which even includes therapy dogs such as Molly, our border collie based at our Frank Lloyd Unit in Sittingbourne. If I were to give advice, I’d say don’t pigeonhole yourself. Where you start off doesn’t have to be where you end up. For example, the trust recruits registered general nurses of all backgrounds; an important message is that you don’t need to be a mental health nurse to work at a mental health trust. When I qualified as a general nurse I would never have imagined I’d end up as a director at a mental health trust!”.